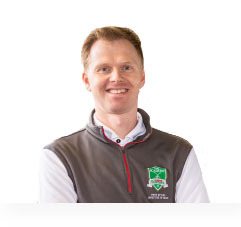 In this video tip PGA golf professionals Pete Styles and Matt Fryer will explain the benefit of creating and using lag correctly in your golf down swing. This should encourage more accurate, longer golf shots that are more cleanly struck specifically with your irons. The concept of the hands of winning the race and utilization of a pumping drill will be explained clearly. Hopefully following this advice will see you strike the best iron shots of your life. So we know that golfers need a certain degree of lag in their downswing this angle between shaft and forearm coming down in the ball. Matt give me a really good solid drill or concept where we can understand what lag is and how we can improve that lag. Yes or what we want is a range drill going to call a race a race trail you've touched on 2 points there the shaft and the hands, think are going to be the most prevalent things we need to think about in this drill, and if we were just turning onto this camera here we know when we don't have enough lag or we spend the angles to where they generally the hands aren't winning the race with an eye and we're talking about here because we want to get a downward strike. So we'd see something where the club head is out in front of the hands and the hands of lost the race. So every race need to finish line where's the finish line? So the finish line is going to be just inside my lead thigh there so we draw a line on there and the idea again we're thinking of club head and hands. Now talking about the race we want to see their hands win the race to the finish line so we'd see at this point now hands are on in front of that finish line and the club head is lagging behind. OK So we'd be up to the top we'd swing down and we'd feel those hands passing the line if the club head just lags behind and we get that nice crisp strike of ball then as we're going through it. It's an interesting concept that because I think a lot of club golfers if you ask the question high handicap golfers typically they would want the club head to get there because they're trying to hit the ball with the club. Exactly they're going to swing down a thing on it you know in terms of the race we'd see this one where the club head is passing the line 1st now and the hands are still behind. So what shot does I guess that happens with that one in some extremes going to see? Some tops we're going to see some heavy ones the ball the ground hit for the ball and sometimes if I manage to time it open sync it well I'd see a lot of high and a lack of distance with my desired club. Then high and no distance doesn't sound too much like a winning combination o me. With a lovely shot and that I think that flicking shot would be even worse if the lie was bad I might get away with it on a decent tee but yeah it was bad and I'm doing it and probably I can go straight under it so if the lie gets worse I need to win the race even more yet we are in the rough be something where the ball is going to go even further back in our stance and we're going to see that we get this angle created we win the race a lot earlier get down into the back of the golf ball and we'd see it pop out and get out of that horrible lie with still the optimal force going into it. So we know that that's hands ahead is reducing the loft yet but we've got enough loft to be OK still. Yeah completely fine OK with that want to talk me through the drive thanks I know the driver has a lot less loft you asked so if I've got 9 degrees and I do this yes I still need to win the race know what we'd like to see is more of a draw because we're going to halve the match in terms of much like or down here but actually are physically a physical half of the match. So give and take that is obviously isn't my driver but what we see obviously the ball is going to move up further in our stance with the driver the finish line is now going to be in the same point still, but the ball's come up to meet it and if you were to pop that line in now what we'd see if I were halving my 9 degree driver let's say and I win the race should my hands with my 9 degree driver. Yeah Could you take a few worms out not going to be great. What we want like we say is that halving of the match and it's a feeling almost a little bit off like it's not scooping too much but it's an actual release a bit of a catapulting motion I'd call it. So if I were to do it slowly here as I come down would have the iron one where I'm winning here but with my driver now they'd both get to the finish line at the same time as opposed to here here we see this half too much there so with an eye and it's fair to say we present less loft than is on the club it is a 30 degree and we probably present 25 degrees. Yes but with the driver if it's a 9 degree driver we present 9 degrees because we haven't got the extra degrees to get away with. So we launched the ball a little bit higher so hopefully that helps you with the understanding of what the lag is and how we can maintain the lag and how maintaining the lag is slightly different with an iron and with the driver. It's super important that we win the race finish line been left shoulder to golf ball and with a driver we have a tied race a draw race the club and the hands cross the line at the same time. Understanding that will help your understanding of lag and also help improve your ball flight and your distance at golf shots.